Hi, and welcome back for another round of the #coffeeandcard session we had today in Brackley. 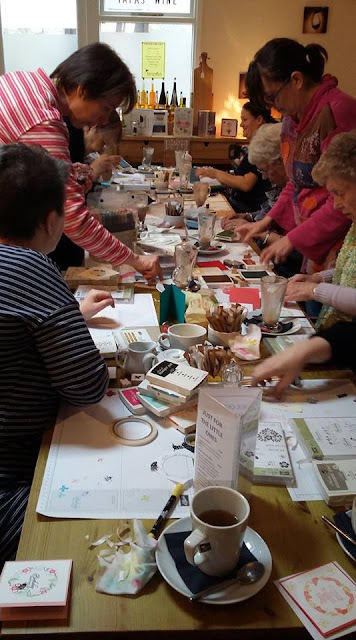 There were 12 of us today, and as you can see, we do rather spread everything out on the tables - thanks goodness the lovely ladies at the Hummingbirds Bistro are very accomodating. 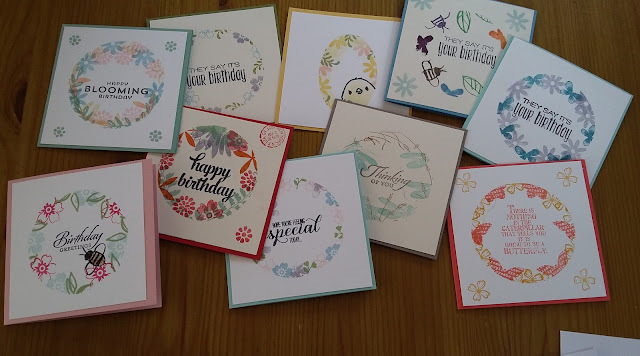 Here are some of the finished cards, we made over 27 cards between us today! I love this simple technique - and many of the ladies went off home to try it out again for themselves. I am busy crafting this afternoon too, making cards to celebrate the achivements of my lovely team. Catch up soon. do you have a tutorial or video on making these for those of us who don't live near you?? ?